Spring to summer. Empty galls in fall. This mite is about 1 ⁄500″ to 1 ⁄125″ long and invisible to the naked eye. Under a microscope it appears spindle-shaped and white, with four legs near the front of the body. 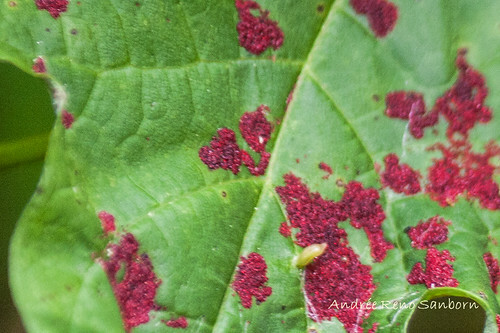 This mite is most easily identified by the shape of the gall it produces and the plant species on which it is found. It is found exclusively on silver maple, red maple, sugar maple, and Norway Maple. The galls first appear in late spring. They are solitary, though there are usually many galls on a single leaf. They stand erect on the upper leaf surface. They are about 1 ⁄5″ in height, spindle-shaped, narrow, pointed at the tip, and slightly wider in the middle than at the ends. They are greenish-white when they first appear, turning pinkish or red, and then finally black. This is the only mite that causes spindle-shaped galls on these host species. It is not found on other plant species. The adult overwinters in a crevice of the trunk or a branch. As leaf buds begin to swell in the spring the female emerges and begins feeding on a leaf bud. This causes the leaf to produce excess cells in the shape of a hollow spindle that rises above and stands erect on the leaf surface. The female then enters the hollow gall and deposits eggs. When the eggs hatch the young feed on the interior of the gall. In the summer the gall dries out. In fall the gall splits open. The adult emerges and searches for a site to overwinter. The galls are unsightly but the tree is otherwise undamaged.